Safari's sixth major revision brings some visual tweaks, a slew of performance and power efficiency enhancements, and Apple's all-new integrated password manager, iCloud Keychain. Safari may never ascend to the same lofty market share heights as Microsoft's Internet Explorer or Google's Chrome, but the browser is still a core feature of Apple's desktop operating system. Here, we take a look at the new features and enhancements Apple added to its default Mac browser. The Top Sites feature, introduced with Safari 4 in 2009, receives a new coat of paint and some minor functional changes. Rather than the three-dimensional effect of Safaris past, Top Sites now shows as a flat wall of preview tiles arranged in a four-by-three grid by default, with the option to add or remove tiles from the preferences menu. Users can still permanently pin or remove specific sites from the grid using buttons in the upper-left hand corner of each tile, but the buttons are now accessed by hovering the mouse pointer over the tile, rather than the edit button that formerly lived in the lower left of the window. Tiles can also be rearranged by drag-and-drop. Other tiles will shift and move out of the way, much like rearranging icons in iOS. 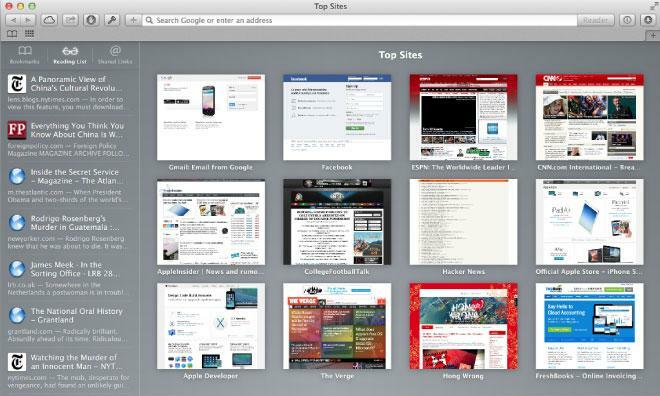 Sitting next to Top Sites, the Sidebar is Safari 7's biggest user interface change. Toggled by a new entry in the "View" menu, the "open book" icon in the Favorites (nee Bokmarks) bar, or with the Command + Shift + L keyboard shortcut, Top Sites is the new home for holdovers Bookmarks and Reading List as well as Safari's new Shared Links feature. The redesigned Bookmarks area works intuitively— clicking a folder will expand it, and clicking a specific bookmark will load the page it points to. Bookmarks can be edited or renamed with a secondary click, and reordered by drag-and-drop. Reading List brings a new, continuous reading mode in Mavericks. 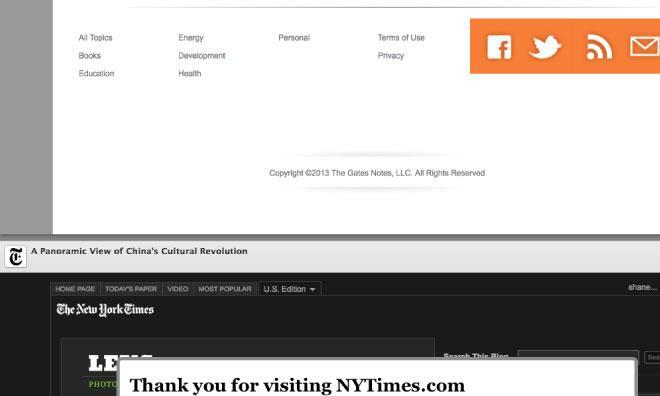 Scrolling past the end of a Reading List story will automatically begin to load the next one. Likewise, scrolling to the top will load the previous story. If a user has a Twitter account configured with Mavericks, Shared Links will collect links from accounts the user follows and display them in the sidebar, along with the sharer's name, profile photo, and the balance of the tweet. Like Reading List, scrolling past the end of one Shared Link will begin to load the new one, and scrolling past the top will load the previous. Standalone buttons for adding links to Bookmarks or Reading List have gone the way of the dodo in Safari 7, replaced by a single, unmovable "+" button attached to the left side of the address bar. Clicking and releasing the button will add the current page to Reading List, while clicking and holding presents a dropdown menu with options to add to Reading List, a specific bookmarks folder, or the Favorites bar. 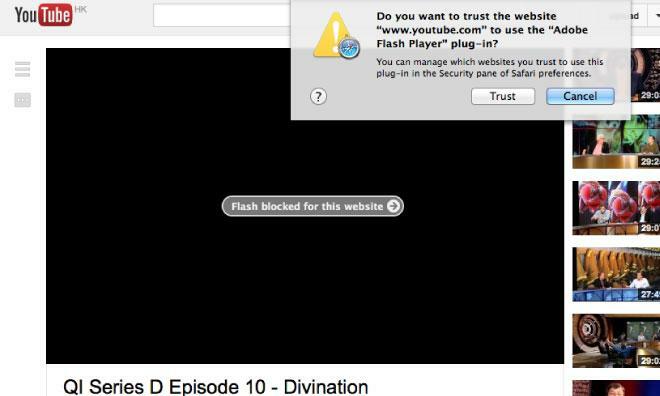 Safari now blocks most plugins by default, asking the user if they would like to enable them on a per-site basis. The first time around, users will be prompted with a binary decision; choosing to "Trust" the site will allow the plugin to be used in perpetuity by that site, while choosing "Cancel" will book the decision down the road until the next time the site asks to load that plugin. Decisions are not final, however. Under the Security section of Safari's Preferences, users can change the setting for each site, as well as swap the default behavior from blocking to allowing on a per-plugin basis. iCloud Keychain is Apple's answer to the age-old password problem of balancing security with convenience. It integrates management of credentials and payment information right into Safari, emulating some of the functionality offered by third-party programs like 1Password. Users are prompted to configure iCloud Keychain during the Mavericks upgrade process, but if they choose not to do it at that time, the feature can be enabled and disabled by a checkbox in the iCloud preference pane. Enabling iCloud Keychain for the first time will walk the user through a series of security steps, beginning with confirming their iCloud password. iCloud will then prompt the user to create a four-digit security code— this code will be used as a way of quickly authorizing other devices in the same iCloud account to use the keychain. 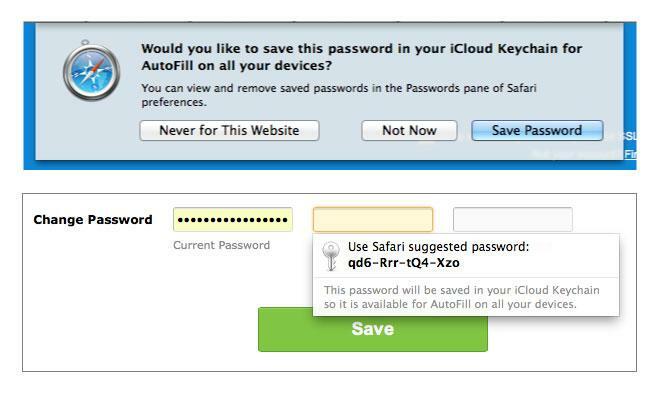 With iCloud Keychain enabled, Safari will continue to ask you whether you want to save your password when logging into websites. Rather than saving locally, however, it will be saved to your iCloud Keychain and automatically replicated to the keychains on your other Apple devices. Safari will also suggest longer, more secure passwords and automatically save them when it detects the user typing in a website's password field. It will do the same for payment credentials like credit cards, allowing the user to choose from a list of saved cards when it encounters a credit card number field. Users will still have to manually enter their card's security code, as it is not stored alongside the card number for security reasons. Bizarrely, however, Safari will not recommend passwords on websites that do not already have a saved password— this means users must first sign up for a website with a password of their own choosing, allow Safari to save that password, and then change their password in the website's interface before Safari will suggest and save one of its longer, random passwords.